While the need to have a Vision is often emphasized for successful organizations, the same holds even more for public policy making. Coherent visions are often absent in mission-critical projects in Kerala and this leads to short-sighted plans which often leave much to be desired. On the occasion of having completed 11,315 days of existence, I took a few minutes off to try and figure out what was my vision for the rest of my life. Since it was still a bit grandiose, my thoughts shifted to why that most essential of all components of a strategic plan for a State or a City was patently absent from how the lives of the citizens of Trivandrum were being planned out by their elected Government and the legions of public servants. Rather than meander through a whole forest of sorry examples of vision-devoid planning and execution, let me just focus on three immediate ones to drive home my point to you, the recipients of this sort of unimaginative thinking. The first example is everyone's favorite infrastructure project, the deep water port and container transshipment terminal proposed at Vizhinjam in the southern part of the city. After reading through in detail, the plethora of reports produced for the project, I couldn't help but come to the saddening conclusion that the highly-paid consultants of the project had failed to realize the true potential of what could be India's most important hub port. Here again, there is a plain lack of vision, which should have been set by the Government or its nodal agency, VISL. Of course, the consultants, led by IFC, were being paid to help come with this as well but their attempts to evolve a vision and a mission, neither are ambitious enough nor are they connected to market realities. In short, Vizhinjam has been sold very short as yet another container port which has to compete with Colombo, Dubai and even the likes of Ernakulam, on mere cost terms. A good vision would have enabled the studies to reflect the fact that with its advantages of proximity to the world's busiest shipping lane, its natural draft and the lack of a need for any major maintenance dredging, not does Vizhinjam have an inherent cost and market advantage, but it could develop into a hub port for the entire Indian Ocean region which has great strategic and economic importance (for example, the fact that the bulk of the world's crude oil and coal sources lie along its rim!). The report played down the potential for ancillary activities such as ship-building (fortunately, CSL doesn't seem to have paid much attention to the report!) and the establishment of a power plant based on imported coal (Kerala can only produce about 40% of even its current power requirement!) No, a real vision would have seen Vizhinjam's true potential to be an economic engine to transform the entire State's economy by introducing for the first time in its history, global logistics connectivity at the best rates possible in India and the promise of abundant power that is a key requirement for economic development. With few, if any, natural resources, Kerala and Trivandrum can only follow the Singapore model which depends on great logistics, abundant and high quality human resources and power availability to foster economic development to propel it far beyond what the rest of India can achieve at the current pace. For this to happen, the Government needs to accept that Vizhinjam is the one Top Priority for it and not joint-third most important project or whatever. From the evident lack of pressure that the State has been putting on the Center to complete the small matter of the security clearance of the final two bidders, one would even suspect if the UDF wishes that if they wait long enough, these bidders would also go away?! If one also factors in the Cabinet's googly in asking CSL to consider Azhikkal rather than Vizhinjam/Poovar as a location for their Rs 1500 Crore expansion, it would seem that their "vision" is see Vizhinjam eke out a living as a fishing hamlet for all of perpetuity! In a better world, one would hope that the Government would complete land acquisition and infrastructure development through budgetary support (rather than wait for debt to be raised, which can happen only after the bid is finalized and the environmental clearance has been realized, by August 2012 at the earliest! 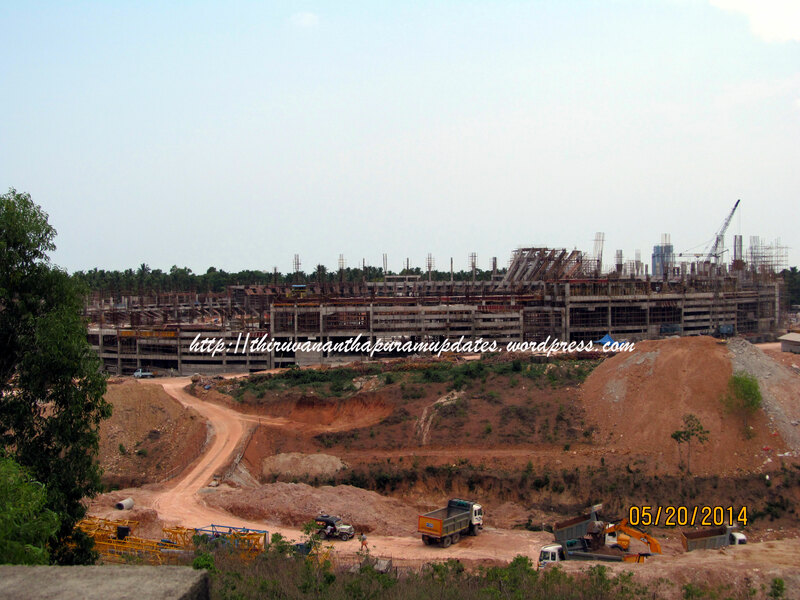 ), create a land bank in Trivandrum district for industrial development related to the port and start to put in place the transportation infrastructure necessary for extending the hinterland of the project out across Kerala and into Southern Tamilnadu (rather than only two districts of Kerala as the current project report would have us believe!). If only the Government had gone in to conceptualize an economic development plan (a Vision!) for the State, which could have then translated down to specific initiatives such as those described above. That would have been cheaper and far more impactful than all those fanciful conference and "investor meets" that the State's industrial promotion agencies host each year. The first draft of a master plan for Thiruvananthapuram is expected to be submitted to the government by December 31. The new Thiruvananthapuram master plan 2031 will be a document outlining the city's development agenda for the next 20 years, focusing on the land use pattern, traffic and transportation, infrastructure, solid waste management and sanitation, which will be revised every five years. A one-day workshop was convened here by the Corporation and the Town and Country Planning Department on Saturday to discuss the preparation of the plan.Officials of various departments; Corporation councillors; chairpersons of standing committees; Corporation officials as well as members of the 19 working groups constituted for giving regional inputs on development issues, trends, area-specific development plans and projects for proposed master plan, took part in the workshop. It sounds like this was another "babu-only" party and doesn't sound like it had avenues for participation by NGOs or individuals who could add a lot of value. I recall that when this whole exercise had been kicked off in 2009, it has been a multi-lateral effort involving the Government, the Trivandrum Corporation, surrounding municipalities and panchayats, NGOs and individuals and I had been lucky enough to participate and present at the brain-storming session. Today, it seems to have been whittled down to a closed-door study which is unlikely to spend much time and effort on such concepts as a Vision. The exercise had begun by looking at the metropolitan agglomeration of Trivandrum, referred to as the Trivandrum Capital Region, but from the way the Corporation is running the show now, it seems that the scope has shrunk back down to just the Corporation which is highly counter-productive considering that the Corporation has expanded multiple times in the last couple of decades and that projects of manifest importance such as Technocity and the IISER & IISST lie just outside its limits. It is safe to assume that by 2021, forget 2031, the Corporation would have expanded to encompass these areas and more. Therefore, the Master Plan for 2031 should look at the entire urban agglomeration and then some, extending from Varkala to Neyyatinkara, and to Nedumangad/Vithura in the East. A real urban area master plan needs to start with a forward-looking Vision statement which then distills down to specific initiatives in land use planning, density, urban structure, transportation, economic and social development and utility planning. For example, it could start with, "in 2031, Trivandrum will be a metropolis of 4 Million people which provides a world-class, economically vibrant, cosmopolitan, equitable and sustainable lifestyle to its citizens." It should be forward looking and should plan for the Trivandrum of 25 years in the future not the city of today or 5 years from now. In this way, unlike past attempts at a master plan which were already out of date by the time they were promulgated, the 2031 master plan at least will have a chance to be relevant at least till 2021! Finally, we come to the recent spate of "transportation" proposals in and around Trivandrum, which include a monorail system for the city, a bullet train linking Trivandrum to Chennai and now, lo and behold, a "pod-car" or Personal Transportation system! Yes, ladies and gentlemen, some hare-brain wants to bring Tom Cruise's car from the Minority Report and use it as a substitute for the monorail. No matter that PRT solutions are used for localized transportation needs such as within airports or within highly dense Central Business Districts, or that they do not have anything near the capacity demanded by a viable mass transit system. Let's ignore these flights of fancy for now, the main concern is that while the Government talks about all those thousands of Crores of investment, there is no coherent plan in place, let alone a vision! Consider the monorail, it cropped all of a sudden, perhaps based on comments made by experts like Dr N Sreenivasan. But the Government took a pretty unilateral call on not just the alignment of the system but also the technology to be deployed. It mandated NATPAC (the one saving grace thus far, NATPAC is a competent choice as opposed to certain agencies whose standard reply to any question, even "what's the day today? ", is "Metro Rail"!!) to submit a preliminary report on the Balaramapuram - Attingal route. This is sort of like a patient coming, complaining of a stomach ache, and the doctor immediately prepping him for surgery without bothering to find out if his ailment is just a bad lunch! If the issue in question was traffic congestion, the solution should have started with an analysis of the traffic situation in Trivandrum and its likely evolution over the next 15-20 years. This in turn depends on a variety of factors such as the urban plan (which is still on the drawing board! ), demographics, socioeconomic development and physical environment. The outcome of this study would be an identification of where, what and when transportation solutions are needed. Is monorail the only choice? Could a cheaper system like BRTS work or do we need to plan for a higher-capacity system like heavy-rail MRTS? Instead of restricting NATPAC to a narrow scope (monorail on a particular corridor), the study should have been much more comprehensive. A study of this nature in 2002, although confined to the then limits of the Corporation, led to the conceptualiztion of TCRIP. In the ten years which have passed since then, it has already become insufficient as evidenced by the congestion experienced on the newly widened roads! Urban planning and transportation planning are a classic chicken and egg combination. One feeds off the other, yet can influence it as well. For example, a new monorail line is usually planned depending on the current and projected urban structure (to connect major hubs and dense residential catchments) but this line can also influence how the city develops because new developments tend to cluster around the mass transit line. The current "one route" mass transit system is utter folly, as evidenced by so many examples in India and across the world, where single lines have failed because of their inability to provide door step to door step connectivity. Only a multi-route network with subsidiary bus services integrated into it can provide a economical, viable alternative to the personal automobile and thus achieve success. As the first step to this, the Government needs to have a vision for the metropolitan area which needs to be translated into an effective urban transportation system. Sometimes, the big picture is lost when one focuses on short term gratification. The question is whether this Government would like to be known as one which dreamed up a gazillion Crores worth of fanciful, never-to-be-implemented projects or one which actually executed fewer but impactful projects such as Vizhinjam and a true mass transit system which improved the lives of citizens for generations to come. Is there a Vision in the room yet?